If an opponent starts their turn with more health than Han Sui or Han Sui is target by an attack that turn, he can discard a black card to attack them at the end of their turn. When Han Sui is revealed, he can then attack the opponent. 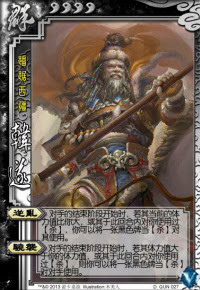 Han Sui can only use "Countering Chaos", if the target started their turn with more health or if Han Sui is targeted by an attack. The attack does not have to be from the target. If a Coerce is used, Han Sui will target the person that is ending their turn, even through they did not attack him. If Han Sui is attacked, he can use "Countering Chaos" even if the target has less health. If someone has the same amount of health as Han Sui, he cannot use "Countering Chaos" against them. Han Sui can only Use black cards with "Countering Chaos". If he has a red attack, it will not work. "Morning Raid" functions only in 1 on 1 mode where each person has three characters. Han Sui can be used in a regular game, but this power is replaced with "Horsemanship". Han Sui does not need to play a card when he uses "Morning Raid". Han Sui uses "Morning Raid" as soon as he appears. This can be after the previous person dies or right at the beginning if he is first.